Ocean population forecasts for Chinook salmon are well below last year's and, due to abnormal ocean conditions, they may be overly optimistic. Accordingly, the commercial, recreational and tribal salmon season alternatives chosen last week by the Pacific Fishery Management Council (PFMC) are more restrictive than any seen in recent years. The 2016 abundance forecast for Klamath River fall run Chinook salmon amounts to 142,200 fish, far below last year's forecast of 423,800. The Sacramento River fall run Chinook forecast — relevant for local fishermen who can travel between Fort Bragg and the San Francisco Bay area — is 299,600 fish, less than half of last year's forecast of 652,000. But population forecasts are becoming less reliable as ocean conditions change. In a preseason report released last week, the first of three before fishing seasons take effect, the PFMC's Salmon Technical team focused its concerns on the reliability of forecasting. 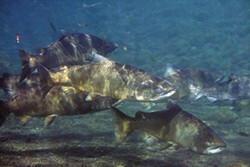 "The abundance of most coho stocks, as well as southern fall Chinook stocks (Sacramento and Klamath), came in well below preseason forecasts in 2015," the report reads, adding that "this pattern of over-predicting abundance for many stocks also occurred during the strong El Niño events of 1982-1983 and 1997-1998." With another "very strong" El Niño in the mix now, the continuation of "several phenomena that can be viewed as unfavorable to salmon" — including low biomass and fat content of copepods, a small crustacean prey species — will affect ocean salmon populations. This year's forecasts may be as inaccurate as last year's. "Given the incidence of over-forecasting abundance for many stocks in 2015, and the apparent continuation of unproductive ocean conditions, the (Salmon Technical team) is concerned that abundance forecasts presented in this report may prove to be optimistic," the preseason report states. Catch allowances for last year's seasons didn't translate into landings. In 2015, only 109,900 Chinook were caught statewide by the commercial troll fleet despite forecasts of robust abundance. "Most of the fisheries had real trouble filling their quotas," said Mike Burner, the PFMC's salmon fishery analyst. What came to be called a "blob" of warm water preceded this year's El Niño, and the combination of events affected salmon distribution and feeding. "Ocean conditions and food supply are very closely tied together," Burner said. "The critical change in the salmon life cycle is when they're out-migrating and once they're in the ocean, anything that affects their food supply has impacts." Drought is another trigger of impacts, but those impacts will mostly be seen next year and beyond. "A lot of the juveniles that experienced drought are out in the ocean now and they will make up our future returns," Burner said. For now, tight restrictions on fishing are being proposed due to the low forecast for Klamath Chinook. Commercial Chinook trollers in the Klamath Management Zone (KMZ) — the area from the state's northern border to the Humboldt Bay South Jetty — are accustomed to being squeezed by September seasons with limited quotas. That will be seen again this year, as all three season alternatives are limited to the month of September, with 3,000-fish and 1,000-fish quotas. A third alternative is complete season closure. A KMZ closure would essentially be a repeat of last year's season, which had a 3,000-fish September quota that was irrelevant. After minimal landings at the season's start, fishermen called it a loss and gave up. Commercial landings for the KMZ totaled 46 fish. For sport fishermen, this year's KMZ alternatives mostly allow fishing for two to three weeks out of each of the late spring and summer months, with a two-fish per day bag limit. Sport fishing opens up in the areas south of the KMZ, with continuous fishing allowed from early April through October or mid-November from the Shelter Cove area to San Francisco. The more restrictive alternatives for that area include a break from fishing from early to mid-June. Commercial season alternatives south of the KMZ offer less fishing time than last year, with seasons starting in mid- to late May for the area between Shelter Cove and Fort Bragg, and the months of June and July closed in two out of the three alternatives to avoid contacts with Klamath fish. From Fort Bragg to San Francisco, seasons start in early May and limit fishing to one to two weeks during June. The alternatives either limit or close fishing during the month of July, but August and September are mostly open in all three alternatives for the area. Though limited, fishing may be favorable south of Fort Bragg. Speaking as a Eureka fisherman and not on behalf of the Humboldt Fishermen's Marketing Association, of which he is president, Aaron Newman allowed that "it's grim because there's going to be reduced time on the water." But he noted that 32 million hatchery fish were trucked to Sacramento River estuaries in 2014 and they'll boost ocean populations even if only a small fraction of them survive. He also described this winter as being different from those of recent years. "The winters have been like summers the last two years — all indications are that we're on the backside of the El Niño now," Newman said. But there's not much to be optimistic about within the KMZ. Tribal catch allotments for the area only amount to about 7,400 Chinook. Dave Hillemeier, the Yurok tribe's fisheries director, said the Yurok allotment is about 5,900 fish. "This is the second-lowest allocation the Yurok tribe has had since the mid-1980s," he continued, with only 1992 dipping lower. "It's less than what's needed to meet the subsistence needs of the Yurok tribe and is likely to provide no economic activity." Last year, the tribe had an allocation of 34,865 adult Chinook but that threshold wasn't reached and only about 26,000 fish were harvested, said Hillemeier. Klamath basin salmon have faced what can be described as a perfect storm of challenges, both at-sea and in-river. 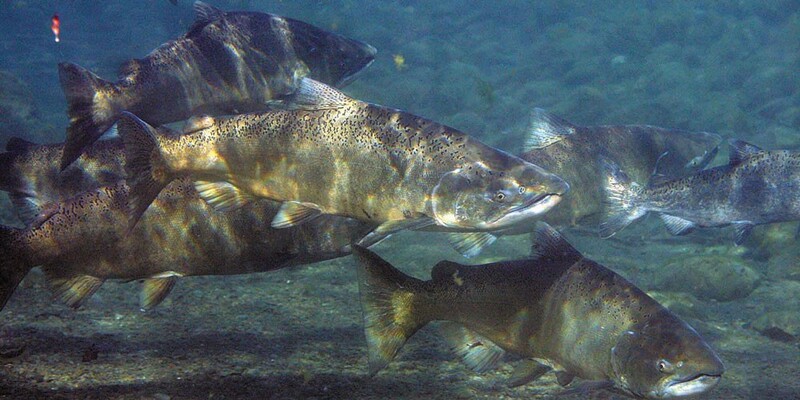 Hillemeier said in addition to warm sea surface temperatures that affected salmon feeding, drought contributed to high rates of infection from Ceratomyxa Shasta, a microscopic, disease-causing parasite. The short-term future is of concern. Hillemeier said the 2015 cohort of juvenile Klamath Chinook experienced a 90-plus percent in-river infection rate and then faced poor ocean conditions. "We'll see them next year as age-three fish and we'll likely be dealing with the effects of it over the next couple of years," he continued. In the long term, removal of Klamath River dams is "the biggest of all actions we can take" to improve salmon runs, said Hillemeier. A second preseason report was poised for release as of press time. Final adoption of the 2016 season fishing seasons is set for the middle of next month.